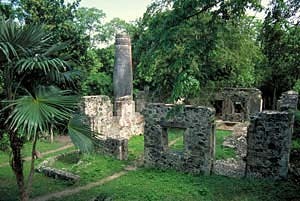 Established by the Danes in 1717, Cinnamon Bay Plantation is one of the earliest sugar plantation settlements on St. John. In 1733 the owner of the plantation, Daniel Jensen, played a pivotal role in the slave rebellion which swept the island. The uprising shook the Caribbean, and the final stages saw the participation of French and English forces to suppress it. The ruins of the former plantation buildings are clustered around the North Shore Road, including the horse mill and "Bagasse Shed," where crushed cane stalks were dried before use as a fuel in the boiling process of the cane juice. The plantation includes the factory building, containing the boiling bench and crystallizing pan, plantation house, cook house, slave quarters, two cemeteries and a warehouse. The Cinnamon Bay Plantation is located off of the North Shore Road in Cinnamon Bay, St. John Island, U.S. Virgin Islands. The Cruz Bay Visitor Center is open 8:00am to 4:30pm daily; closed Christmas Day. The park areas are open 24 hours a day year round. Visit the park's website or call 340-776-6201 for more information. Cinnamon Bay Plantation has also been documented by the Historic American Buildings Survey.